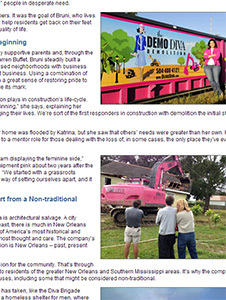 Demo Diva’s hot pink dumpsters and excavators have been a part of the New Orleans landscape for years now. 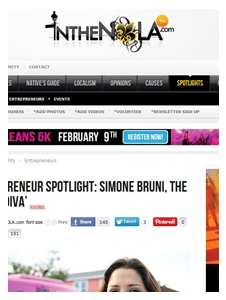 Despite her company’s sassy name, founder Simone Bruni is down-to-earth and dedicated to supporting her community. 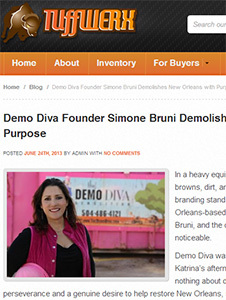 Simone Bruni Crouere, Skip of 1989, started Demo Diva Demolition following Hurricane Katrina. With no construction experience and no family members in construction, she had to sell trust to her customers: trust me to help you, I’m your neighbor, trust me I’m from New Orleans, trust me I’m an Ursuline girl! In a community that was upside down and an influx of outsiders, New Orleanians wanted to work with locals. In the span of a day. Simone Bruni Crouere seemed to have lost everything — everything except for her resilience. A New Orleans native. Simone had been working in the hospitality industry for 10 years. She just purchased her first home in Lakeview a neighborhood of the city of New Orleans. She was loving life. Then Hurricane Katrina hit and changed everything. Her house was destroyed, and she was laid off from her job. But that didn’t stop her. in fact. the tragedy inspired her. 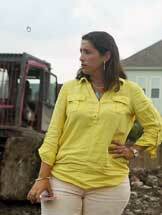 Simone Bruni, 43, lost her home in Katrina, and her job as a party planner. She also lost neighbors who couldn’t afford to get back home. “They could hardly afford the demo,” she said of one couple who lived four doors down. 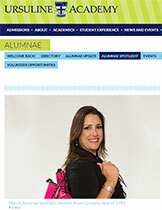 But Katrina also made Ms. Bruni. 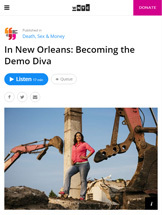 Ten months after it struck, she began to festoon the ruined neighborhood with signs for her new post-storm venture, a company that she had cheekily named the Demo Diva. She played up her femininity, deploying hot-pink Dumpsters and trucks, and built a multimillion-dollar business tearing down ruined homes. 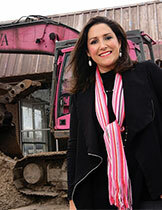 Simone Bruni never imagined she would someday run a demolition company. “I grew up in a very traditional Latin home,” she says. “My mom did not work. I wanted her life. I wanted to be a stay at home mom.” But when Hurricane Katrina hit, Simone was 32 and single, working in the hospitality industry. 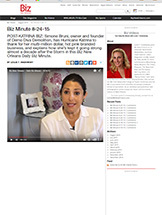 POST-KATRINA BIZ: Simone Bruni, owner and founder of Demo Diva Demolition, has Hurricane Katrina to thank for her multi-million dollar, hot pink branded business, and explains how she’s kept it going strong almost a decade after the Storm in this Biz New Orleans Daily Biz Minute. 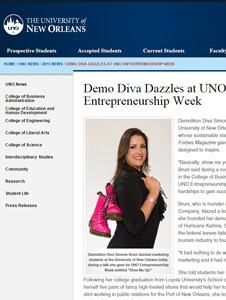 Demolition Diva Simone Bruni dazzled marketing students at the University of New Orleans today talking about shoes. The woman whose sustainable start-up demolition business has made the pages of Forbes Magazine gave a speech entitled “Shoe Me Up!” that was designed to inspire. 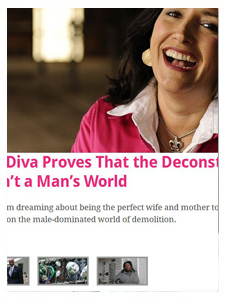 Simone Bruni, the “diva” of The Demo Diva Demolition Company, knows firsthand that that one person committed to helping their hometown can improve everyone’s quality of life. Before rebuilding New Orleans could start following Hurricane Katrina in August 2005, there had to be demolition and cleanup: that’s where Bruni took the stage. 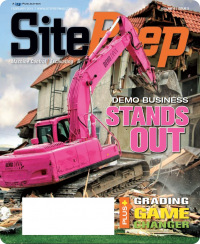 June 2013: In a heavy equipment world full of yellows, browns, dirt, and grime, Demo Diva’s vibrant pink branding stands out. Get to know this New Orleans-based company and its founder, Simone Bruni, and the differences are even more noticeable. 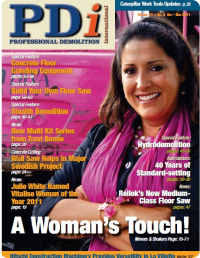 January 2013: Simone Bruni went from dreaming about being the perfect wife and mother to making a huge impact on the male-dominated world of demolition. January 2013: “This is a man’s world!” the King of Soul, James Brown, famously proclaimed in 1966. 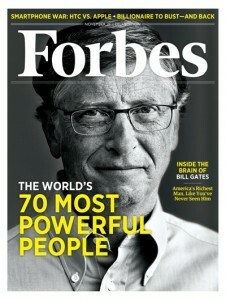 While he was certainly right in some regards, there’s no denying that women are doing big things as well. November 2011: While disasters often spawn opportunity in their wake, Katrina’s devastation was so profound that it reshaped the psyche of New Orleans residents, including its entrepreneurs. 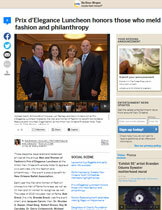 February 2011: New Orleans owner thinks outside the box with business built from the wreckage of Katrina. 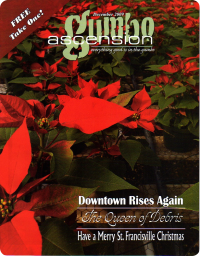 January 2011: The Movers & Shakers juggernaut rambles on. But this time it’s painted bright pink and driven by a woman. The woman’s name is Simone Bruni, and she has proved that women can be just as successful as men in the tough business of professional demolition. June 2010: New Orleans native turns disaster into opportunity. 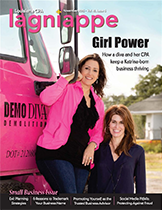 Simone Bruni draws people to her business, the Demo Diva Demolition Company, with her bright smile, compassionate attitude, and bright pink everything. 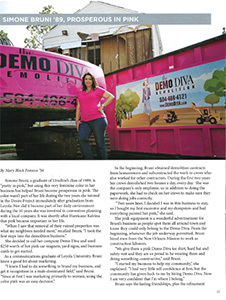 December 2009: Meet the lady who owns the pink demolition bins and equipment scattered in and around New Orleans. The Demo Diva saw a need for, well, tearing stuff down after Hurricane Katrina. 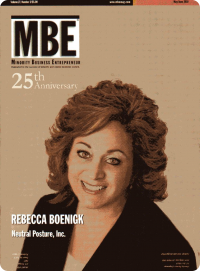 December 2009: Demo Diva featured in the annual report for Gulf Coast Bank & Trust, offering SBA (Small Business Administration) Loans in New Orleans, Jefferson Parish and Baton Rouge. September 2009: Though he favors a bright pink construction helmet, Simon wears many hats, including gourmand, job-site overseer and reality television star. 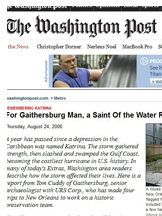 August 2006: he address was supposed to be a demolition. It was on the Red Tag list after Hurricane Katrina, but when we finally found Hastings Street, the house was long gone.